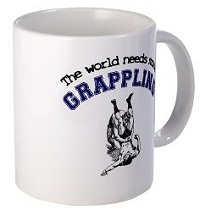 Answer 20 questions correctly and win wrestling gifts. 1. Members get one FREE credit to play each new trivia game. New members automatically get one too. 2. If you answer all questions correctly, you WIN! After a select number of winners, the game will be closed until the next one. So play soon! 3. If you don't win first try, you can obtain more play credits by buying any item below, then correct your wrong answers. Purchased credits carry over each month too. 4. Credits will be added within 24 hours of purchase. If you don't see it added after 24 hours, email me from your directory email. Include purchase transaction number. Note: Credits have no cash value and are not redeemable for anything other than playing this game. If your membership ends before using your credits, they will be carried over when you rejoin and keep directory listing. You must be a Premium member and logged in to play this game. Feel free to play any of the games and puzzles below. 4. What is the name of this hold? Join WrestleMen to view wrestling videos, pictures, wrestling stories, chat live, and access the full wrestler contact directory!